– La Vie En Rose – | The World of C.C. Since yesterday my feeling has been unbelievably depressed and stressed, over the “chain reaction” of bad luck caused by hayfever and therefore, my lack of sleep. It costed me my chances of getting a job I like to work in, and a chance to work with an organization that valued the importance of art as much as myself. I presume they would not hire me, as the result of the chain reaction went just too horrendous to talk about. As my boss from the community project I am currently engaging with, WISE (Women in Social Engagement) decided to make roses from fabrics. I was sincerely excited yet nervous for the hardship of making it. As Edith Piaf’s “La Vie En Rose” played on throughout the sessions I was frustrated with myself not just for not able to make the rose look right, but also the feeling of anxiety and fear over many things – especially on finding a job as at the moment a lot of jobs (well 5 or 6 precisely) I applied had all rejected me straight after the application. There is a part of me wondering if I done something wrong to gain such bad luck, it is painful for me to see people who went through similar things found their success when I seemed nowhere near. 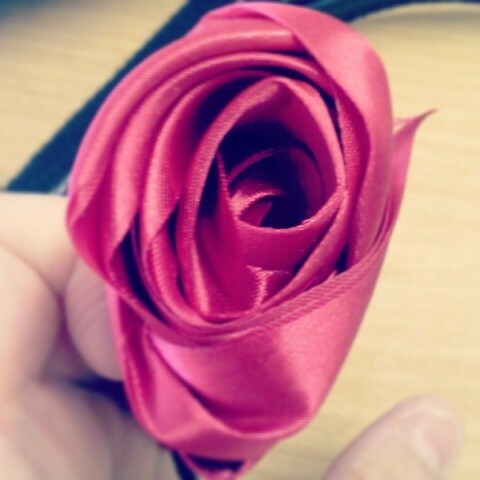 Anyway, at least I managed to make the rose looked like a proper rose – close enough.